I found a well established pear tree on an abandoned block of land that I recently inspected as a potential site for my small scale farm dream. The area was originally settled by Italian families around 150 years ago and what remains (along with the ruins of the old stone homesteads) are little orchards, a reminder of the people that once lived off this land. We often drive around the country looking for that perfect block, and sometimes we come across some gems, like this block that had a creek running through it, an old orchard and one of the biggest walnut trees I've ever seen. It must have been planted 150 years ago. And right next to the gigantic walnut stood a few old pear trees. The fruit looked ripe, there was plenty of it, so I grabbed a few. 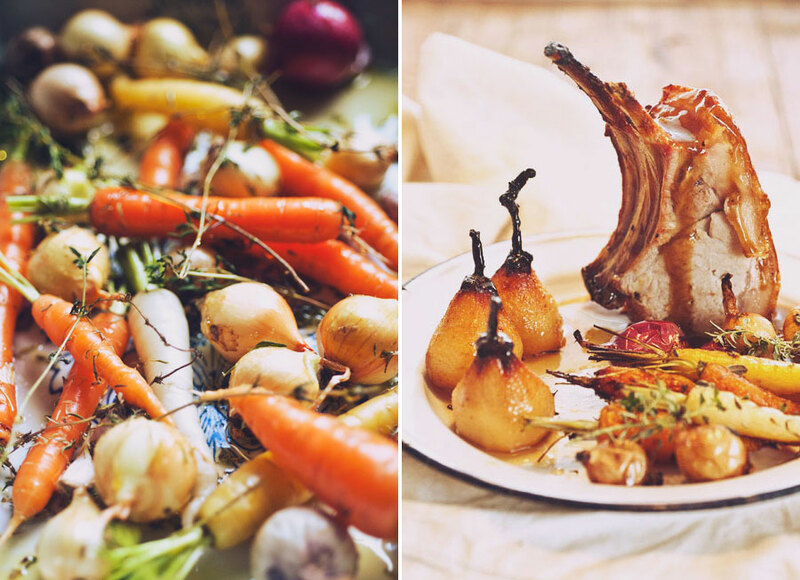 A week ago I bought a pork rack roast from the farmers at Greenvale Farm and was going to make an apple and cinnamon sauce from some apples that my mate Fran gave us recently, but we loved them so much they got eaten straight away. So my next best option was to utilise these foraged pears. Honey baked goodness! Worked well with the pork and roast garden veg. Should I pop it in the recipe book?